I praise God for the beautiful way He presented the Christmas Story through the many people who joined together to make the Living Nativity a wonderful celebration! I am thankful for the willing hearts that allowed room in their busy schedules to make room for Jesus this Christmas! Yes, I did make room in my busy schedule to make room for the Living Nativity, but what about other days, other seasons of life? What does it look like to make room for Jesus? When I think of making room for someone it often requires changing some of my things around to so they can feel comfortable. It requires changing my schedule to accommodate theirs. It means I must adapt my life so that the other person can live theirs. Jesus doesn’t have physical things to bring into my house, but He is with me all the time! Jesus doesn’t have a to-do list hanging on my refrigerator, But He has works He wants me to do! How must I live so that Jesus can live His life through me? 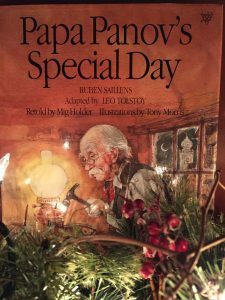 There is a story “Papa Panov’s Special Day,” about a shoe maker who had a dream that Jesus was going to come and visit him on Christmas, the following day. He woke up to a cold morning and after putting on a pot of coffee he noticed the road sweeper out on the street. He called to him and welcomed him in for some warmth and a cup of hot coffee. A little while later he noticed a young woman carrying a baby. She looked thin and was dressed in shabby clothes. He invited her into his shop as well and offered her some soup and bread, and warm milk for her baby. He noticed the little boy had no shoes and went to his shelf and pulled down a little pair of shoes he had made and gave them to him. All throughout the rest of the day as he eagerly waited for Jesus to come all he saw were people walking by his shop. To some he gave smiles, to some he gave bread, and to some he gave a coin, but Jesus never came. That evening as he was sitting in his chair disappointed that he hadn’t seen Jesus, he began to “see” the faces of all who passed by his shop that day. Watching for Jesus gave the shoe maker a new perspective. Expecting Jesus gave the shoe maker a new purpose. Making room for Jesus made room for others! To make room for Jesus I need to re-arrange the things in my life that so subtly creep in to steal our time together. I need to look for Jesus in God’s word because that is where I find the instruction and the greatest examples of how to make room for others! I need to expect Jesus to show up in my day so that I don’t have a “me first” attitude. It is so easy to go throughout my day unaware of the needs of those around me. I walk right past. Talk right over. Drive right through. My mind is so caught up with what I need to do and where I need to go, I don’t make room to notice or help others. I realized that when everyone made room in our schedules to make the Living Nativity happen, it allowed for God’s story to be told. It was a celebration of the true meaning of Christmas so all who came could see and hear of God’s Love, Light, and Life come to earth. This is what making room for Jesus is all about, so those around us will see and hear of God’s Love, Light, and Life so they too will make room in their hearts for Jesus! Heaven knocked on the door of the inn, but there was no room. The inn keeper welcomed many people into his inn that night. Many people who were hungry and weary from their long journey to Bethlehem. The inn keeper was busy feeding and providing for all their needs. He had no time for one more guest to come into his inn. The inn keeper had no idea that heaven itself was knocking on his door. The Wonderful Counselor, Mighty God, Everlasting Father, Prince of Peace was knocking at his door. Yet, he was too busy, his inn was too full of people to welcome heaven to come inside. The inn keeper turned heaven away; he sent Him to the stable. And in that distant stable, that place away from the busyness and fulness of life, heaven entered this world. 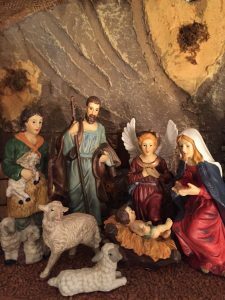 Jesus was born in his stable on that silent and holy night. He missed heaven because his inn was too busy, too full to let Jesus come in. Jesus says in Revelation 3:20, “Behold, I stand at the door and knock. If anyone hears My voice and opens the door I will come in to him and dine with him and he with Me.” Jesus is still knocking on doors. Not the doors of inns, but on the doors of men’s hearts. He is still looking for hearts that have room and welcome Him in. Though Christmas time is often busy and filled with too many things to do, may you choose to make room for Jesus to live through you as you reach out with His love and compassion to meet the needs of those around you. Sometimes I wish I could have a “It’s a Wonderful Life” experience. When George is at the end of himself an angel comes and “rescues” him from himself, and then proceeds to give George a gift. The gift of seeing his life as though he were never born. Obviously that isn’t possible in real life, but I was talking with Kayla the other day and we were pondering what life would have been like if Mark and I had stayed in Waldwick instead of moving to Ringwood. Of course it was only a one sided view as we reminisced of all the things that have occurred because we live here that never could have taken place if we hadn’t moved. I don’t know which of us was more surprised. I honestly hadn’t really thought that thought before it came out of my mouth. I suppose it was in my mind, but I had never given into thinking about moving. I never considered it an option. And even as I said it I didn’t expect it would really happen. That sentence turned out to be a game changer. After I put voice to that, when I put my feelings and that idea into the atmosphere it put things into motion. Sometimes there are conversations between husband and wife and in the moment things are said because they seem to be the right things to say, and then life happens and those things that were said don’t become reality. I was amazed when that single sentence I put into the atmosphere that summer day at Spruce Lake became reality! I see this verse as the answer to understand how everything unfolded in amazing ways as we made the decision to look for a place to move. As Kayla and I were talking the other day one thing that came up that never would have happened is the Living Nativity. The first Christmas we celebrated here Mark was Joseph, I was Mary, and Mark read the Christmas story to the audience that was our friends and their families of our small group that met each week. We began in our house as the angel came to tell Mary of God’s plan. Then we went outside and I rode our horse as Mark led him up to our barn. 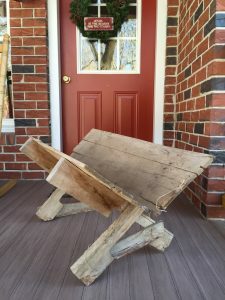 There baby Jesus was born and laid in a hand-made manger Mark made from a pallet. 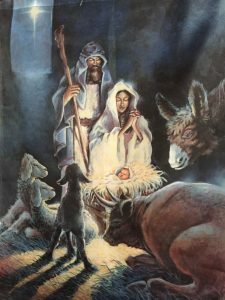 It was very simple, but from that was born the Living Nativity that has taken place for twenty years since shining the light of the true meaning of Christmas into this dark world. It is a reminder to me that there is a bigger picture to life than I could ever imagine! While I may see my desires and decisions from my perspective and as the fulfillment of what I want for myself, God has so much more in mind. God’s thoughts are so much greater than mine! God’s ways are so much higher than mine! Though moving here to Ringwood was something that I really wanted and I saw it as something that would be for my profit, I now see so clearly that God intended for it to be for the profit and salvation of others. 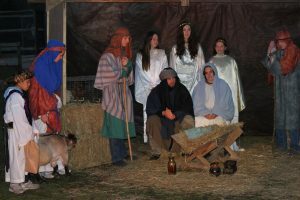 Several years ago the Living Nativity out-grew our property and has moved to Solid Rock Day Camp in West Milford. I’m very thankful for Scott and Bonnie, the camp directors, and many others, who have joined together to keep the Light of the true meaning of Christmas shining bright. This Saturday, December 8, we will celebrate the true meaning of Christmas with the presentation of the Living Nativity at Solid Rock Day Camp with two performances, one at 5:00 and one at 7:00. It is free and open to all. Please join us and may the simplicity of the Christmas Story be a reminder that small, humble beginnings bring forth great profit to the lives of others, and are intended for the salvation of many!